The Energizer® Vision HD+ headlight is another innovative headlight solution within the Energizer® premium headlight line. With the latest LED technology, users get a bright, lightweight hands-free solution with ample run time capability. 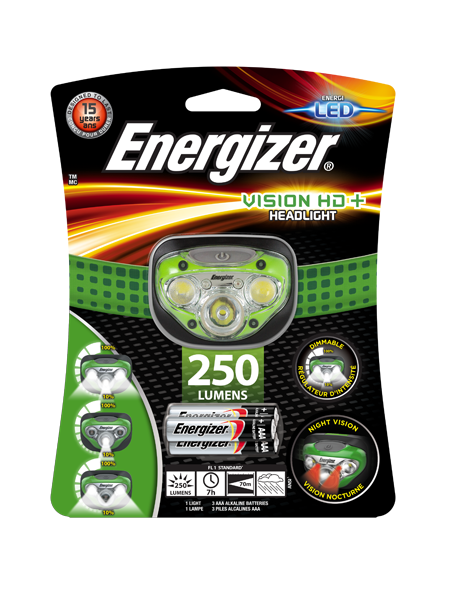 Patented optics offer exceptional direct and peripheral vision, making the Energizer® Vision HD+ a perfect light for home, work and outdoor activities. With the advanced dimming feature on all modes, users can control the intensity of light from 100% to 10%. Consumers also enjoy the Next Push Off technology to avoid unnecessary switch cycles. With an adjustable head strap, water resistant design and pivoting head to direct light exactly as needed, this headlight is another way Energizer continues to deliver innovative lighting solutions.